Wood drill bits have a special tip that cuts wood. Do not use them for harder materials! 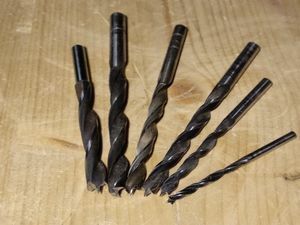 In contrast to other twist drill bits, these typical wood drill bits have a central spur and are much harder to sharpen. These and other drill bits urgently need better storage solutions! When you sharpen them (Lukas kind of knows how - instructions coming soon), make sure to also file down the spur so the cutting edges are allowed to come in contact with the wood. Especially on large diameter bits, an oversized spur can hinder drilling by acting as an unwanted spacer. Lukas also has a set of 3/4/5/6 mm bits with typical wood countersinks hugging the shaft. These require some filing down to give the countersink's set screw more purchase (already done for the 3 and 4 mm bits). a piece of masking tape is great as a quick & dirty "depth stop"
Forstner bits can have much larger diameters than twist drill bits and create holes with a flat surface (except where the pilot tip leaves its mark). This makes them especially well suited for installing pot hinges! If you need a hole that goes all the way through your piece, hole saws may be an option as well. They are usually used in a stationary setup, i.e. with a drill press. Although they look pretty complicated, they can be sharpened by hand with medium effort. Forstner bits are not very good at transporting shavings away. 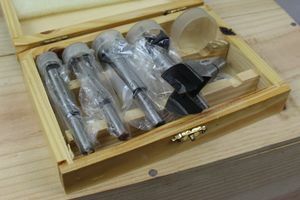 There is a shared set with bits of 15, 20, 25, 30 and 35 mm diameter on the drilling table. Lukas also has a 1-5/8" (41 mm) bit that you can borrow - this size is needed to cut holes for tealight candles. Spade bits are easy to sharpen, commonly available in large diameters and usually have pretty long shafts. As they are not designed for transporting wood chips, you may have to pause and clean the hole now and then. Auger drill bits are long and helical, with a threaded tip that pulls them into the workpiece. Typically one would drive them by hand, using a brace to deliver high enough torgue. Going slowly is important as the lead screw would otherwise strip its hole and lose purchase. Drilling pilot holes is a bad idea (nothing for the screw to grip!) 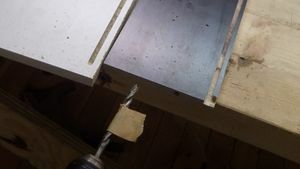 but you may like to drill the first few mm with a Forstner bit for a good start with clean edges. Lukas has a 19 mm auger bit to prepare dog holes in workbenches. In addition, Patrick brought in a few ancient ones and a matching brace that we are going to restore to their former glory! Have a look at this video by James Wright on some auger bit basics, including sharpening.